USPS Mailing and Shipping Rates for 2019 | Central Business Systems, Inc. 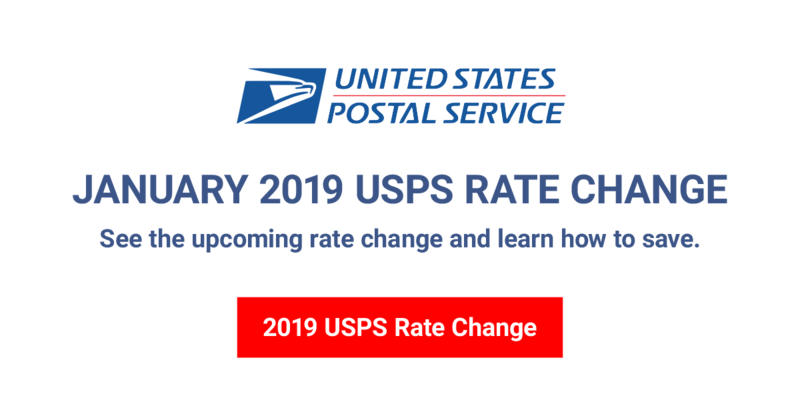 The USPS filed their mailing and shipping rate changes on October 10, 2018, to the Postal Regulatory Commission (PRC). These changes are approved and will take effect on January 27, 2019. Here are the most popular mailing and shipping products and how they will be affected under the proposed rate changes. Review the Postal Regulatory Commission’s statement here. Mailing and shipping rates will be raised but you can leverage your mailing system for discounted metered mail rates and look into a shipping system to get Commercial Based Pricing. In fact, you’re incentivized to do just that! Remember, the USPS still has an edge over other carriers because it does not add surcharges for fuel, residential delivery, or regular Saturday or holiday season delivery. First Class Mail: Meter That Mail! The USPS requested a 5 cent increase to the 1 oz. Forever Stamp, increasing to 55 cents—the highest price jump since 1991. Time for the good news: postage meter customers pay a discounted rate of 50 cents for each 1 oz. First-Class single mail piece. That is a savings of 5 cents over the retail rate, which can really add up. For example, the average small business mails 5,000 mail pieces a year, with the discounted meter rate they will save 9 percent, adding up to $250 in annual savings! According to the USPS, they will increase retail rates an average of 5.9 percent on Priority Mail and an average of 3.9 percent on Priority Mail Express. Retail rates are the prices you pay when you ship from the Post Office. The alternative is Commercial Based Pricing (CBP), which are discounted rates given to those that use a shipping system, like NeoShip. For example, the retail rates for one of the most popular products, the Padded Flat Rate Envelope, will increase from $7.25 to $8.00. However, if you get Commercial Based Pricing using a shipping system, the rate for a Padded Flat Rate Envelope still increases but to a lesser extent, going from $7.05 to only $7.50, still providing a significant savings. The USPS is decreasing its DIM weight divisor from 194 to 166 making it more important than ever to package your shipments properly. DIM weight mostly affects large but light-weight packages, driven by the fact that they take up room so they should cost more than they would based on weight alone. The divisor is changing from 194 to 166 (UPS and FedEx are 139). So if you send a 3 pound lampshade in a box that is 15” x 11” x 11”, using the USPS cubic inches calculation of 15 x 11 x 11 divided by 166, the dimensional weight of this package becomes 11 pounds. That is almost four times the lampshade’s actual weight. Click here to find current DIM weight information and download our definitive guide.